Here is the recipe for one of the fiery spicy condiments from Indonesian cuisine. Sambal is the native to the cuisine of Indonesia, Malaysia, Sri Lanka and Singapore. The word Sambal is an Indonesian loan word from Javanese origin (sambel). It is the staple in Malaysian and Thai cooking. They called this condiment as Sambal Olek which means ground chili, where olek means the mortar and pestle used for grinding this condiment. Traditionally sambal is freshly ground using a stone pestle and mortar which has a coarse texture and consistency. Sambal is a hot sauce made from a mixture of chilli peppers or dried chili along with ginger, garlic, shallot, vinegar, sauces and the shrimp paste which gives a fishy flavor. Recently while i was googling, i got a sambal recipe which is purely veg. So for this veg version, i skipped using fish sauce and shrimp paste in this recipe. 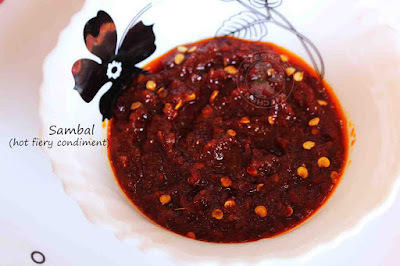 I made this sambal recipe the following day and had it as a condiment along with my breakfast. With the leftover sambal, i made a hot prawn dish namely sambal udang. I strongly recommend to use this hot spicy condiment to add spice and flavor to most of your favorite dishes. A must try recipe for all those hot fiery dish lovers. You can spice up your stir fry recipes, noodle dishes, soups, fish recipes with a small portion of this hot sauce. This hot and spicy condiment can be prepared ahead of time and can be refrigerated. Now a days it is available in most of the supermarkets. Still i prefer homemade freshly ground sambal for adding to any fish or chicken recipes as it is quick and simple. Soak red chili in hot water for few minutes and then coarse grind them well in a mixer. To this add shallots, ginger, garlic and again grind it to a smooth paste by adding little water. Now heat a pan with oil and add the paste in this. Cook it until oil floats on the top. When done, season it with sugar and salt. Mix well. Finally add some lemon juice and mix well. Set aside. Garnish with some dried chili seeds.